sponsorship options Platinum Sponsor - $15000 (exclusive sponsorship) As an elite platinum sponsor you will recieve: • your company logo will be prominently displayed at the entrance, on the bar station, on the eventbrite page, facebook private page and general sponsor signage. • 12 social media announcements in the private group • 5-min opportunity to say a few words at the brunch • Promotion video posting in the private group. As a charging station sponsor you will recieve: • your company logo will be displayed on the charging table, on the eventbrite page, facebook private page and general sponsor signage. • 3 social media announcements in the private group • One item to place in the swag bag • 1 complimentary registration Luxury Gift In-Kind Sponsors During the brunch we will be providing Luxury giveaway item of $100.00 or more to attendees. As an In-Kind sponsor you will recieve: • recognition when your giveaway is provided • a social media posting private group Customizable Sponsorship We are happy to work with you to come up with a specific sponsorship that works for your company’s goals. For details, inquiries and/ or sponsorship requests call 240.242.9246 or email info@thep3solution.com to build a special sponsorship that’s ideal for your organization. sherron & blu A leading expert in the marcom industry, Sherron provides innovative, solution-driven insight, that identifies ideal marketing techniques. Sherron has been described as the â&#x20AC;&#x153;real-dealâ&#x20AC;? when it comes to engagement. She is tremendously skillful at creating and cultivating authentic interactions that generate synergy that flourish into countless opportunities. She uses a combination of her marcom business acumen, online and offline to create networking experiences with a distinctive and lasting presence that encourages and influences others to be more willing to build an integral relationship. Sherron created the BluExperience to fill in the gaps in the networking space where women couldnâ&#x20AC;&#x2122;t obtain quality connections in an open enviornment. 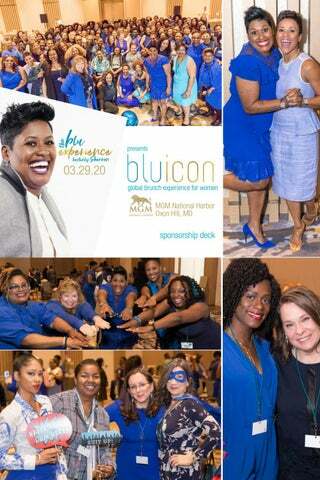 The BluExperience is designed to create a unique, yet elite networking experience where women not only meet incredible women around the globe but they are able to build lasting connections that create tons of opportunity.